Director: Julie Delpy. Cast: Julie Delpy, Chris Rock, Alexia Landeau, Alexandre Nahon, Kate Burton, Albert Delpy, Dylan Baker. Strictly speaking this is a sequel of the 2007 Woody-Allen-esque “2 Days in Paris” (well…Woody Allen in his old days, of course), but it also stands on its own and works simply as a stand-alone story and certainly you won’t need to have seen the first part in order to find your bearings through this. However if you have seen “2 days in Paris“, you’ll probably come into “New York” with a certain baggage and knowledge which might help you in appreciating (and liking) the central character of Marion a bit more than this film gives you reason for. A lot in the depiction of Julie Delpy‘s character Marion and her relationship with American boyfriend Mingus has to be taken for granted here, even if it’s all quite unbelieveable. Don’t take me wrong, it’s all rather charming and light enough to be entertaining, but the script lacks the subtlety, the romanticism and the sharpness from its predecessor, while at the same time it plays up all the possible French clichés one would expect: and so the French seem to have no sensitivity,nor social skills, no hygiene and of course they all love their fromage: these are all predictable targets and I suppose the only surprising twist is that all comes from a French person willing to make fun at her own country (Julie Delpy also wrote and directed the film). It’s all rather superficial but the jokes keep on coming, the culture clash at the centre of the film brings enough laughs and mercifully the overall lenght is only 96 minutes. There are some indulgences which I didn’t find particularly successful: Mingus’s monologues in front of a cardboard cut-out of Omaba are not as funny as they should be and the sequence where Marion tries to buy her soul back from a notoriously difficult actor playing himself (I won’t spoil here who it is, but if you google him you’ll be able to find out quite easily) is too indulgent, too knowy, and outstays its welcome and in the end looses that potentially quirky charm it could have had. But the biggest and most refreshing surprise of the “2 Days in New York” is actually Chris Rock who despite the lack of chemistry with his co-star and an underwritten role, manages to pull out not just the best performance in the film (sweet, understated and charismatic) but possibly the most interesting and revealing of his career. Let’s just hope this is the first of many others to come. Directed by Céline Sciamma. Cast: Zoé Héran, Malonn Lévana, Jeanne Disson. This small independent film was made for peanuts (Filmed on a Canon 5D and just a handful of people in the crew) and it is unlikely to make any big impact on the box-office. However I’m sure it’ll leave a mark on those few who will actually manage to see it. In fact judging by the recently released long list from the 2012 BAFTA Awards Nominee, where TomBoy shows among some other nominees, it looks like I am not the only person who has been touched by it. Zoé Héran is absolutely wonderful as Laure, the 10 years old girl who’s just moved into a new neighbourhood where nobody knows her and pretends to be a boy (Michaël) with her new friends. Her performance is one of the best of the year, and possibly among the best ever performances by a child: she not only perfectly captures that innocence that children of that age have, but at the same time she seems to have a deep understanding of the struggle and the pain of her character. Throughout the film she really acts as if she was a real boy in a way that’s so believable that at some point I really started to wonder whether “she” was actually a real “he”. The film knows that and it does play with you by stretching the lie as far as it possibly can, until it decides to show you the real truth in a beautifully handled scene where you do actually see briefly the girl naked. It’s a fleeting moment and the film obviously doesn’t linger on it, but it’s enough to put our minds at rest so that we can carry on enjoying the rest of the story. The director Céline Sciamma’s ability to film children making it look real is incredible. It feels effortless as if the camera was one of the children themselves and we as the audience are left observing them playing in the forest as if we were spying on them, or as if it was all a documentary. Rarely I have seen scenes with such young children that feel so honest and real: the approach is subtle and light, the atmosphere is almost muted, dialogue to advance the story is used to a minimum and the silences are charged with meaning and intensity. This is a subject that rarely makes the news, let alone the movie theatres. And it’s so refreshing not just to see it depicted in this film, but to have it told with such an understanding, honesty and open-mindedness. All this together with the stellar acting from little Zoé make the internal drama of Laure/Michaël even more poignant and powerful. Be warned, this is a slow film (a very short one too at only 82 minutes), that has “French independent” written all over it, from its pace, to its rough look and its lack of music score, but if you, like me, love films about children growing up, this sensitive, tender and never heavy-handed story might just melt your heart too. I saw it months ago and I still remember it vividly, so it must have worked on me. C’mon, let’s just face it: the fake-documentary/found-footage genre which started off with the admittedly original Blair With Project, has probably been running its course for quite now while! Cloverfield sort-of worked for about half of its length, Paranormal Activity (which seemed to have scared everybody else but me) is a one-time-trick-type-of-film which felt a lot longer than it actually was, the last exorcism could have worked but was not only heavy-handed but also had one of the most terrible ending of recent memory, even the Spanish outing REC outstayed its welcome and actually went nowhere. In the end they all suffer from the shaky-cam exhaustion and from the fact that, being part of that found-footage genre, it’s pretty easy to see how they’re all going to end. I had been hearing glorious things about “Troll Hunter” ever since the first screening in Norway last year. The trailer seemed intriguing enough and the first few reviews from several known newspapers here in the UK for some reason were all rather positive (I wonder if the film had been American whether it would have been embraced with as much warmth). I must that say aside from the fairly good special effects, which nowadays don’t really surprise me anymore, I found it all rather predictable and actually quite boring. Yes, the settings might be original (with those desolate, cold and yet glorious Norwegian landscapes) and there was a certain appeal about the way the director filmed everything in a certain matter-of-fact way as if this was all indeed a real documentary. I suppose there was an noble attempt to try to mix horror and comedy, but the main problem is that I didn’t find it particularly scary nor funny. The concept is of course ludicrous and the Trolls are just way too silly looking to cause any real fear (in fact they are a lot more scary when they are just off camera), and as far as the comedy aspect is concerned, the jokes come much too late into the film and they are way too few (Well yes, the Muslim joke is rather enjoyable… but that was pretty much about it). Otherwise I felt I was left with a lot of running about in the forest (definitely too much for my taste) and not enough to care about. Last but not least, even the big scary final Troll, instead of coming as a surprise is actually spoilt in the poster itself! Strange marketing campaign. Directed by Gareth Edwards. Starring Whitney Able, Scoot McNairy. When reviewing a film like Monsters you can’t help dealing with 2 things: the film, of course, which is essentially a road movie with some added Alien Monsters. And then you’ve got the making of the film itself, which is the issue everyone has been talking about (and that’s somehow even more interesting). The budget of “Monsters” is reported to be under $500.000, shot with a camera in the region of $15,000, which in Hollywood wouldn’t even be able to cover the rental of the main camera for a week. And yet Gareth Edwards has been able to come up with movie which looks like any of those blockbusters out there, if not even better. His background is from Graphics and Visual effects and it clearly shows. Here we are dealing with somebody who really knows the tricks on his trade. There’s hardly a frame in the film which hasn’t been treated or altered in some sort of subtle way: whether it’s just in the grading and colour of the pictures themselves which really makes it look and feel like any feature films out there, or whether it’s a detail way off in the background (an helicopter flying in the distance, the wreck of a tank, smokey ruins) and finally, obviously, the title’s ‘monsters’ themselves (though this ones, are the more showy and, to a degree, less successful Visual effects). Gareth Edwards is very aware of the limitations of his trade too. His handheld camera moves in such a way that he’s always able to diguise his effects and trick the audience. In the best tradition of great movies which have monsters in them (Alien, and to a degree, Jurassic Park and even Jaws), he wisely keeps them well hidden to the audience for most of the time (the monsters are only seen at night times or on TV newscasts), thus creating a sense of foreboding and adding a lot more tension to the story. Unfortunately as a film, “Monsters” is a lot less groundbreaking. 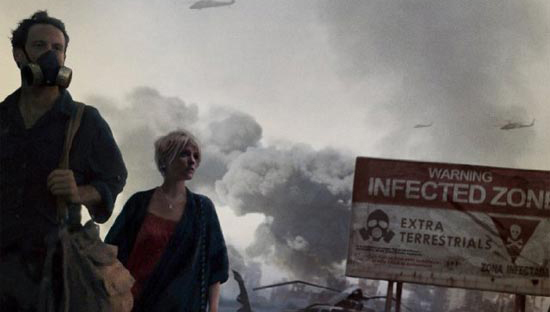 For some reason it has been compared to District 9, but it has neither the inventiveness, nor the humor, let alone the high concept and underlying subtext of Neill Blomkamp‘s sci-fi from 2009 (which I loved, by the way). From there onwards the film is essentially a road movie where the two main characters have to reach the US border, crossing the so-called infected Zone in Mexico. That’s pretty much it. He’s clearly an interesting director: he’s good a framing his action, directing his actors and creating the right type of mood, so it will be interesting to see what he can achieve with a proper budget (and a better script) in the future: unfortunately it looks like he might be getting stuck with Monsters, as it just emerged that he will be directing a new Godzilla Movie (he’s been quoted in Variety saying “you just don’t say no to Godzilla”): not very imaginative, I’d say. So now we’re only left to see how Hollywood will respond to a film like this which looks like any multimillion dollar flick, and yet it costs just a fraction of what Michael Bay would spend in taxis. In the end, this will be the only legacy of this film: it cost nothing to make andyes it’s watchable. I’ll take this over Transformers anytime.